Is your business ready to grow by adding a new vehicle to your fleet? While it may be exciting to think about expansion, you may be concerned that this process could take days, weeks, or even a month. The new vehicle may need lots of work done – glass repair, window tinting, and, of course, you will want to add graphics to match the other vehicles in your fleet. You have many choices when it comes to how you get all of this work done. You can go from shop to shop and have your vehicle transformed in stages, or you can bring this new vehicle to Team Acme – a one stop shop for fleet services. We can often decal your vehicle to match the others in your fleet, complete all necessary glass repairs, and even tint your windows – all in one day! In just one day, you could have your new vehicle making money for your company. No need to wait, no need to go from shop to shop. Team Acme’s crew can get your new vehicle on the road quickly! ● Auto Glass Repair – As one of the only AGRSS certified repair shops in the Las Vegas area, we can repair or replace all types of auto glass – windshield chips, cracks, or damaged back or side windows – all while keeping your employees’ safety in mind. ● Window Tinting – Team Acme uses state of the art carbon based film for vehicle window tinting. This material does not interfere with cell phone signals, GPS devices or other electronics. Window tinting is a necessity in the hot Las Vegas sun, so tinting your fleet is a great investment. ● Graphic Design – Our experienced design team has fitted thousands of vehicles in the Las Vegas area with the perfect eye catching graphic design for more than a decade. Our custom templates will ensure that the designs are consistent from vehicle to vehicle. We can match the designs already used on your fleet or help you come up with a new and exciting look. Vehicle advertising is a direct, inexpensive, and cost effective form of publicity for your company. With a fleet of vehicles promoting your company, you will not believe how many new leads you will get. If you already have a fleet, do not hesitate to expand your reach with a new vehicle. 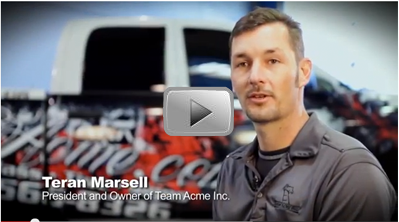 Team Acme can help you get your new vehicle on the road in record time. Partner with Team Acme and you will be assured of the highest quality products, the strongest customer service in the area, competitive pricing and an extremely quick turnaround time. We guarantee your satisfaction with our work! Call us today at (702) 566-8326 and speak to Doyle about opening up a fleet account. We can help you get your newest vehicle ready and on the road to working for you – often in less than 24 hours!